zucchini | Time to Cook! This recipe uses raw corn and zucchini, which I wasn’t brave enough to try! I boiled my corn on the cob for 9 or 10 minutes and then removed the kernels … and I blanched the zucchini for a quick minute. I also made the vinaigrette (olive oil and lemon) in a separate small bowl and added it into the salad (I didn’t use it all). I would definitely double this recipe as it only serves 2. This would be great for lunch or a BBQ dinner while fresh corn is still available. Recipe from blog Gourmette NYC. 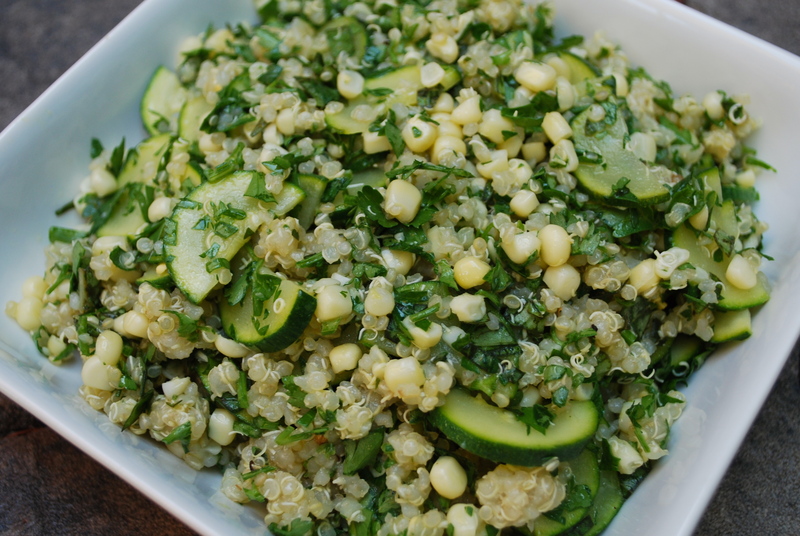 In a large bowl, toss the quinoa, corn, zucchini, parsley, and basil. Add the olive oil and lemon juice and toss, adding more olive oil and lemon juice if desired. Salt and pepper to taste. This is a wonderful tasting, moist and healthy muffin that you can feel good about giving to your kids or enjoying as an afternoon snack. After tasting these, you won’t believe there isn’t any white flour, sugar, butter or vegetable oil in them. They truly taste decadent — and they’re not! Note: if you don’t have the wheat germ or flax, substitute with oats and the muffins will turn out fine! Recipe adapted from the blog Baking Adventures in a Messy Kitchen. To prepare, grate the zucchini, using paper towels to squeeze out any excess moisture, and mash the banana. Heat the oven to 375 degrees. 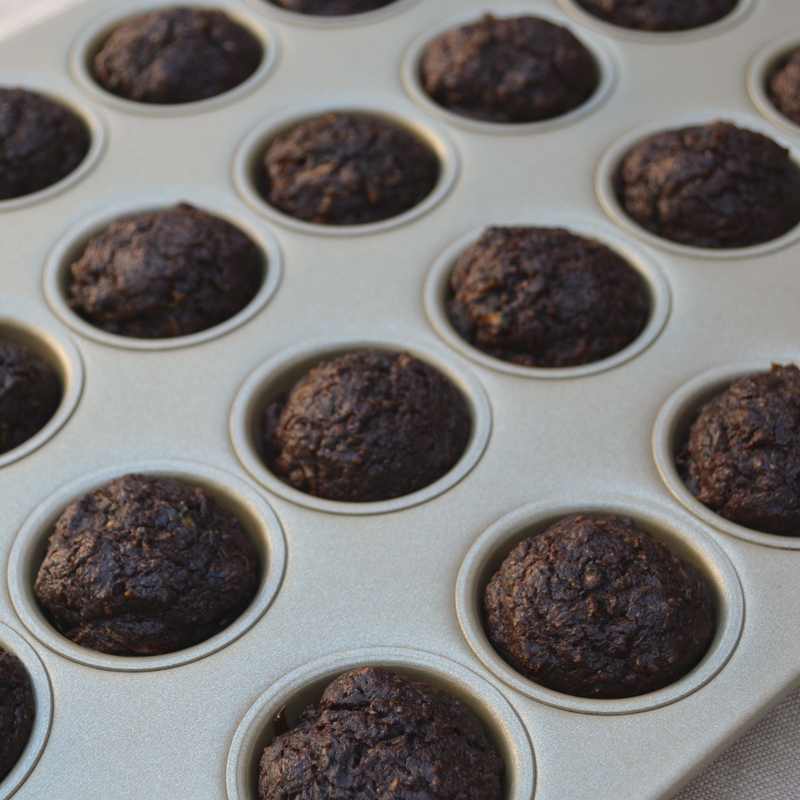 Grease mini muffin tray, planning for 45-50 mini muffins. Using a stand mixer, beat together the zucchini, honey, molasses, coconut oil, eggs, banana, yogurt, and vanilla until well mixed. In a separate bowl, combine the flour, wheat germ, flax seed, cocoa powder, baking soda, cinnamon, and salt with a whisk. Add the flour mixture to the stand mixer incrementally, beating on low speed, stopping as soon as the flour is fully incorporated. Remove the bowl from the stand and fold in the dark chocolate mini chunks. Scoop the batter into mini muffin cups (filling just over 3/4 full), and bake them in the oven for approximately 13 minutes. Let sit in the pan for a few more minutes, then move to a wire rack to cool completely. Try to eat just one. Really. Try. I have a weakness for zucchini bread and banana bread. It’s great to snack on and great toasted with butter for breakfast. 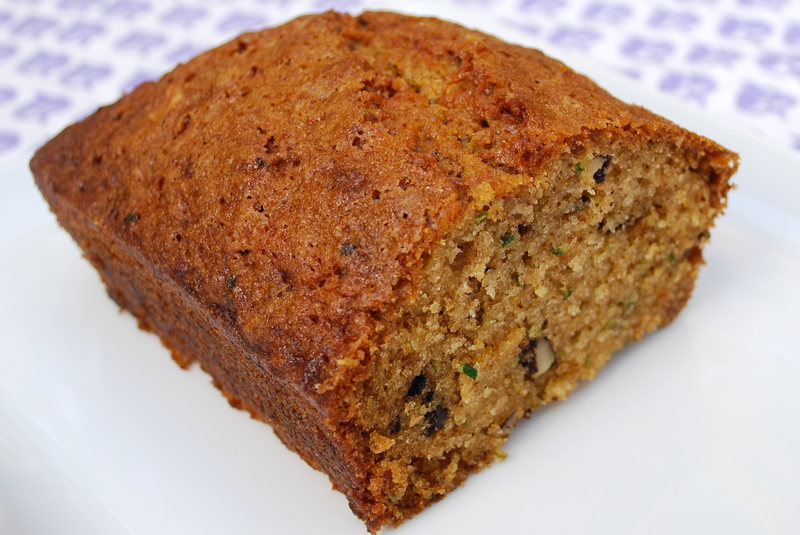 This is my favorite zucchini bread recipe – I don’t think it gets any better than this! Recipe slightly adapted from The Silver Palate Cookbook. 1. Pre-heat oven to 350 degrees. Generously butter two 9×5 inch loaf pans. Line bottoms of pans with parchment paper and brush with butter. 2. In a large bowl, beat the butter, eggs, oil, sugar and vanilla until light and thick. Fold the grated zucchini into the oil mixture. 3. Sift the dry ingredients together in a separate bowl. Stir into zucchini mixture until just blended. Fold in the walnuts. 4. Pour the batter into the buttered loaf pans. Bake on the middle rack of the oven for 1 hour and 10 minutes or until a cake tester inserted in the center comes out clean. 5. Cool slightly, remove from pans, and cool completely on a rack.